Gum disease, or periodontal disease (perio from “around” and dont from “tooth”), is a common condition affecting millions of Americans. Most only have mild gum disease, but about 30% suffer from severe gum disease that causes loss of the bone support for a tooth. Gum disease is caused by inflammation of the gums as a result of bacteria in “plaque”, a sticky film that forms on your teeth. Gum disease can progress to affect the bone and ligaments that support the teeth, and can cause eventual tooth loss. There are several types of gum disease but they can be classified into two main forms, or stages. In its mildest form, gum disease is known as gingivitis. In this stage there is some inflammation of the gums but no lasting damage to the bone and connective tissue. Symptoms of gingivitis include non-painful swelling and redness of the gums and there can be bleeding when brushing or flossing. Here the gum disease has advanced below the gum line. Toxins produced by the bacteria in the plaque irritate the gums causing chronic infection that eats away at the bone and connective tissue around the tooth. The plaque hardens, called tartar or calculus, which can irritate gum tissues and gives bacteria more surface area on which to grow. As a result, the gums starts to detach from the tooth, forming a pocket between the teeth and gums. 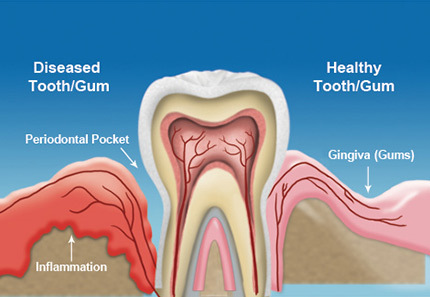 We can detect periodontal disease by probing the depth of the gum pockets. 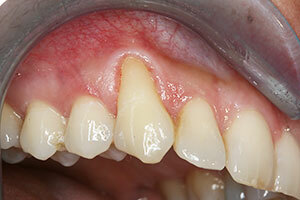 A pocket depth of around 4 mm indicates beginning gum disease. A pocket depth of 7 mm or more indicates severe gum disease with the highest risk of permanent damage. The gum pockets trap food and plaque and become infected, affecting the neighboring tissue and bone. As periodontitis progresses, the pockets deepen and gum tissue and bone are destroyed. In its last stages, so little bone and connective tissue are left around the tooth to support it that the tooth becomes loose and may have to be extracted. Receding gums are a sign of periodontal disease. Symptoms can include chronic bad breath, tender or painful gums, receding gums, swollen gums, bright red gums, bleeding gums, and as the disease becomes more severe, chewing may become painful and teeth can become loose and shift. As a note, bleeding of gums may cease when the disease progresses, as the inflammation is now inside the pocket and not accessed by your toothbrush or floss. Severe periodontitis is indicated by pocket depths of 6 mm to 8 mm. Acute periodontitis: Painful swelling of the gum tissue caused by bacteria trapped below the gum line. Chronic periodontitis: This is your usual progression of gum disease, causing deeper pockets and loss of ligament and bone support for the tooth. Apical periodontitis: When a nerve dies in the root canal of the tooth, there can be inflammation and loss of bone support at the apex, or end, of the root. A more recent breakthrough is DNA testing for the type of bacteria prevalent in the gum disease. Some bacteria are more harmful than others and require more aggressive attention. We can prescribe bacteria-specific antibiotics for best results. If you are concerned that you might have severe gum disease, or previous treatment hasn’t gotten your periodontitis under control, we offer a free consultation to learn what your next step should be. We will examine your teeth and gums and assess the extent of your gum disease, and advise on the best way to treat it. We will explain treatment options and answer any questions. We offer non-surgical periodontal treatment that includes expert deep cleaning, bacteria-specific antibiotic treatment and laser assisted periodontal therapy. We also work with your general dentist to keep your gums healthy. The leading causes of gum disease are genetics, smoking and plaque. Genetics. Some people are predisposed to gum disease (studies estimate it at 50%) but if you treat your teeth and gums properly you can avoid getting it. Smoking. A recent study shows that the bacteria most damaging to the gums reside in the mouth of a smoker. Plaque. Plaque is the soft bacteria that coats teeth. If removed at least once every 24 hours you will go a long way to controlling this factor of gum disease. Calculus. This is hardened plaque found below the gum line. It accumulates more plaque and causes loss of bone support around the tooth. Poor diet. A poor diet can cause many adverse and chronic conditions in the body, including gum disease. A diet consisting of fast food and few fresh vegetables and fruits can lead to gum disease. Most regular vitamins don’t provide enough nutrition either, but you can find whole food vitamins that will help supplement your diet. Other physical conditions. Systemic illness and certain medicines can aggravate gum disease or predispose you to it. Diabetics are more likely to have gum disease, and gum disease is often considered a complication of diabetes. Other physical conditions influence the gums, such as pregnancy, HIV and leukemia. 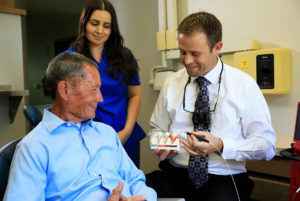 We take the time to explain our procedures and discuss how to maintain excellent oral health. Poor quality restorative dentistry. We sometimes see patients who have accumulated bacteria underneath poor-fitting crowns or bridges. As part of our treatment regimen we provide you with comprehensive education on how to control your gum disease or prevent future recurrence.